Bike The Longer Road follows hot on the heels of the hugely successful book BIKE: Tar & Gravel Adventures in South Africa in 2011, MapStudio now offers the sequel, BIKE: The Longer. Whilst the first book focused on shorter trips in South Africa, The Longer Road details 8-10 day long journeys not only in South Africa but also in neighbouring countries – Namibia, Botswana, Zimbabwe and Mozambique. The Longer Road will take readers on an expedition through some of Southern Africa’s most scenic and picturesque spots including Sossusvlei, Victoria Falls, the Okavango Delta and the Cederberg wilderness area. Whether you want to explore one country at a time or five in one trip – there is a route available to meet every need. Longer itineraries take bikers into unknown territory, therefore full map coverage of all the destinations have been included with the focus on adding as much detail as possible. The Longer Road also includes information on bike-friendly accommodation and camp sites, historical monuments, mountain passes, national parks and even adventure activities in the specific regions. Another addition is an extensive gear list with in-depth reviews on bikes, tyres, camping gear, GPS systems, communication tools and luggage systems. 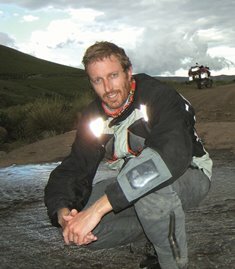 Greg Beadle has just completed his second book covering adventure motorcycling routes through Southern Africa. Greg was born in Johannesburg and now most happily resides in Cape Town. Greg is well-known for his photographic work which takes up around 50% of his business time. He favours capturing the energy and emotion of any dynamic adventure and/or action-based genre, ranging from thoroughbred stallions to super car motoring clientele. Greg also documents top-drawer sporting events throughout the year, including the Tour de France, the Cape Epic, the Argus cycle tour and the Two Oceans marathon. Clients include Oakley (USA), Specialized Bicycle Components (USA), BMW cars, BMW motorcycles, Mini, Ducati, Capestorm, First Ascent, Nedbank and Old Mutual. Greg’s work has been featured in international lifestyle,travel and sporting titles in the USA, UK, Germany, France, Greece, Japan and China. Greg’s other business interests include The Bureau photographic office, agency and studio as well as two other shared creative office spaces in Cape Town. Next Greg will be launching a new art tool called ArtGrip, an innovative yet simple method of hanging posters and prints. Greg along with his girlfriend Megan enjoy surfing, yoga, cycling and taking on new adventures together. Be the first to review “BIKE – The Longer Road (eBook/ePub)” Click here to cancel reply.